Chemical transmission is the major mechanism of synaptic communication in the brain. To understand how neurotransmitters function, several issues must be addressed. These issues include how neurotransmitters are synthesized, released, removed from the synaptic cleft, and metabolized. In addition, it is important to identify the characteristics, anatomical loci, and functional properties of the receptors that mediate the actions of these transmitters. Moreover, wherever possible, the role of these transmitters in the central nervous system (CNS) functions and their linkage to clinical disorders need to be considered. A neurotransmitter is defined as a chemical substance that is synthesized in a neuron, released at a synapse following depolarization of the nerve terminal (usually dependent on influx of calcium ions), which binds to receptors on the postsynaptic cell and/or presynaptic terminal to elicit a specific response. The criteria for accepting a substance as a transmitter include: (1) the substance must be synthesized in the neuron, and the enzymes needed for its synthesis must be present in the neuron; (2) it must be released in sufficient quantity to elicit a response from the postsyn-aptic neuron or cell located in the effector organ; (3) mechanisms for removal or inactivation of the neurotransmitter from the synaptic cleft must exist; and (4) it should mimic the action of the endogenously released neurotransmitter when administered exoge-nously at or near a synapse. Neurotransmitters in the nervous system can be classified into the following major categories: small molecule transmitters, neuroactive peptides, and gaseous neurotransmit-ters (Table 8-1). An action potential depolarizes the presynaptic nerve terminal, voltage-gated Ca2+ (calcium) channels located in the presynaptic terminal membrane open, Ca2+ permeability increases, and Ca2+ enters the terminal.These events cause the membrane of the vesicles to fuse with the presynaptic membrane at the active zone and release the neurotransmitter into the synaptic cleft (Fig. 8-1B). This process of transmitter release is called exocytosis (see the following section). The neurotrans-mitter then diffuses across the synaptic cleft to the membrane of the postsynaptic neuron, interacts with its specific receptors, and opens or closes several thousand channels in the postsynaptic membrane, through which specific ions enter or leave the neuron (i.e., the permeability of different ion species is changed [Fig. 8-1C]). The nature of the response (i.e., excitatory or inhibitory) elicited at the postsynaptic neuron does not depend on the chemical nature of the transmitter. Instead, it depends on the type of receptor being activated and the ion species that becomes more permeable. For example, acetylcholine (Ach) produces synaptic excitation at the neuromuscular junction (skeletal muscle contraction) by binding with the cholinergic nicotinic receptor, whereas the same transmitter produces an inhibitory response (decrease in heart rate) by interacting with a cholinergic muscarinic receptor located in the cardiac tissue. As stated earlier, chemical synapses are much more common than electrical synapses in the nervous system. They are involved in mediating complex functions. One of the important characteristics of chemical synapses is that they can amplify signals (i.e., a small presynaptic nerve terminal can change the potential of a large postsynaptic cell). ATP = adenosine triphosphate; GABA = gamma aminobutyric acid. The process by which a neurotransmitter contained in vesicles is released into the synaptic cleft is called exocytosis. This process is complex and incompletely understood. The events leading to exocytosis can be summarized as follows. 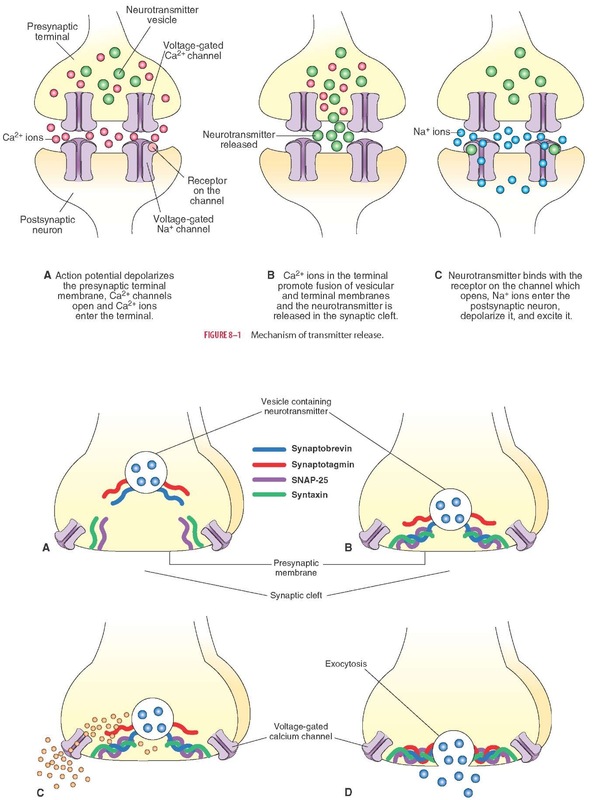 The vesicular membrane contains a SNARE protein ("SNARE" stands for "SNAP Receptors," "SNAP" stands for "Soluble NSF Attachment Protein," and "NSF" stands for "N-ethylmaleimide Sensitive Fusion Protein"), synaptobrevin, and a calcium-binding protein, synaptotagmin.The presynaptic membrane contains other SNARE proteins, syntaxin, and SNAP-25 (Fig. 8-2A). The SNARE proteins in the vesicular and presynaptic membranes interact to form complexes, and this interaction results in close apposition of the vesicular and the presynaptic membranes (Fig. 8-2B). 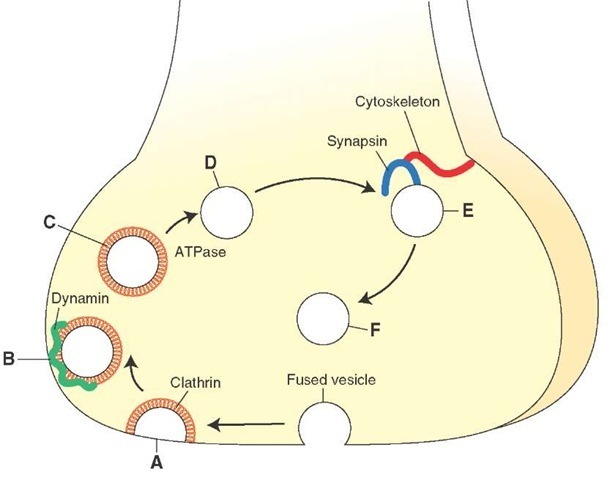 Depolarization of the presynap-tic terminal membrane by an action potential results in the influx of Ca2+ ions into the terminal through voltage-gated Ca2+ channels.Calcium ions interact with synaptotagmin, and this interaction promotes fusion of the vesicular and presynaptic membranes (Fig. 8-2C). An opening develops in the fused membrane and the contents of the vesicle are released into the synaptic cleft (Fig. 8-2D). The neurotransmitter released into the synaptic cleft binds with specific receptors, and a response is elicited. The released transmitter enters back into the terminal by an uptake mechanism and is recycled for subsequent release. Some neurotransmitters (e.g., Ach) are degraded in the synaptic cleft, and one or more of their degradation products are taken back into the terminal and reused to synthesize the neuro-transmitter in the terminal. Initial formation of vesicles takes place in the endoplasmic reticulum and Golgi apparatus located in the neuronal cell body. The vesicles are transported to the terminal by axonal transport. During exocytosis the vesicular and pre-synaptic terminal membranes fuse. Thus, new membrane is added to the presynpatic terminal membrane. The fused vesicular membrane is retrieved and recycled within a minute by a complex process called endocytotic budding. The process can be summarized as follows. Several proteins, including clathrin, form a basket-like lattice on the remnants of the fused vesicle giving the appearance of a coated pit (Fig. 8-3A), which is then pinched off from the presynaptic membrane by another protein called dynamin (Fig. 8-3B) and the coated vesicle moves into the cytoplasm (Fig. 8-3C). The coating is removed from the vesicle by a number of ATPases (Fig. 8-3D). Another protein, synapsin, brings about tethering of the newly formed uncoated vesicle to the cytoskeleton (Fig. 8-3E). When mobilization of the vesicles is needed, protein kinases phosphorylate synapsin causing it to dissociate from the vesicle, which contains the appropriate neurotransmitter and is ready to undergo the process of exocytosis (Fig. 8-3F). 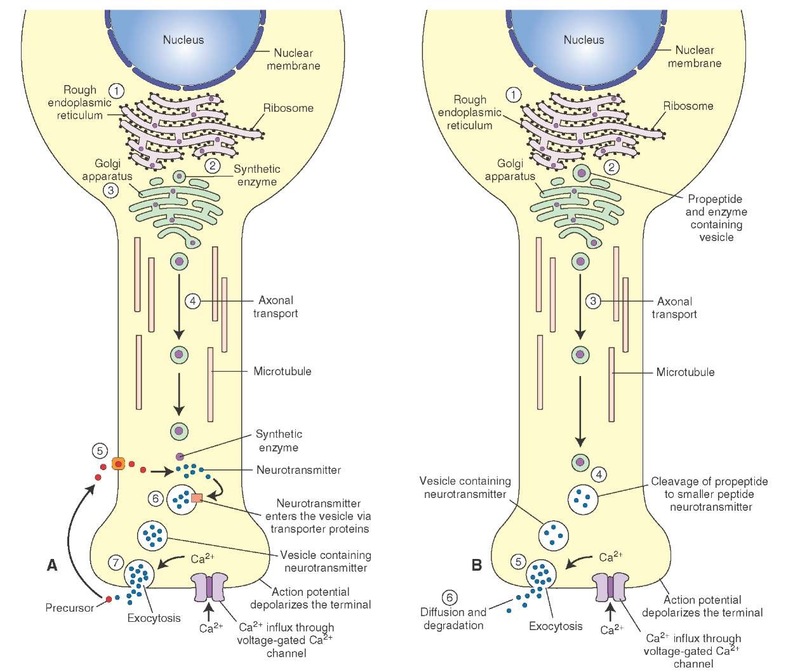 Thus, during continuous neuronal activity, the retrieved vesicular membrane is recycled in the terminal to form new synaptic vesicles and contains the neurotrans-mitter that is then released. In this manner, rapid replacement of synaptic vesicles during continuous neuronal activity becomes possible because synaptic vesicles form in the terminal. The synaptic vesicles produced in the neuro-nal cell body would not be readily available due to the long distance between the neuronal cell body and the terminal. Some of the vesicular membrane retrieved from the cytoplasm of the nerve terminal is transported back into the cell body and is either degraded or recycled. FIGURE 8-2 Steps involved in exocytosis. (A) SNARE (SNAP receptor) proteins on the vesicle and the presynaptic plasma membrane. (B) SNARE proteins on the vesicle and the presynaptic plasma membrane form complexes. (C) Formation of SNARE protein complexes pulls the vesicle closer to the presynaptic plasma membrane and Ca2+ (calcium) entering into the terminal via the voltage-gated Ca2+ channels binds with synaptotagmin. (D) Binding of Ca2+ to synaptotagmin promotes fusion of the vesicle to the presynaptic plasma membrane. FIGURE 8-3 Recycling of synaptic vesicle membrane. (A) Clathrin, a protein, coats the remnants of the vesicular membrane. (B) Dynamin, another protein, pinches off the coated vesicular membrane. (C) The coated vesicular membrane is now carried into the cytoplasm of the presynaptic terminal. (D) An ATPase removes the coating from the vesicle. (E) Synapsin, another protein, binds to the vesicle and attaches it to the actin filaments in the cytoskeleton. (F) A protein kinase phosphorylates synapsin, which then dissociates from the vesicle. The vesicle then undergoes further processing before it can participate in exocytosis. The following steps are involved in the synthesis, transport, and release of small molecule neurotransmitters (Fig. 8-4A). 1. The enzymes required for synthesis of small molecule transmitters are synthesized in the neuronal cell body in the rough endoplasmic reticulum. 2. They are transported to the Golgi apparatus. 3. In the Golgi apparatus, they are modified (e.g., sulfation, glycosylation). 4. Soluble enzymes (e.g., acetylcholinesterase, tyrosine hydroxylase) are transported along the axon to the nerve terminal by slow anterograde axonal transport (0.5-5 mm/day) via microtubules. The remaining enzymes are transported by fast anterograde axonal transport. 5. The precursor needed for the synthesis of small molecule neurotransmitters is taken up via transporter proteins located in the plasma membrane of the nerve terminal, and the neurotransmitter is synthesized in the presynaptic nerve terminal from the precursor. The enzyme needed for the synthesis of the neurotransmit-ter is synthesized in the neuronal cell body and transported to the terminal. 6. The synthesized pool of the neurotransmitter in the cytoplasm is taken up into small vesicles by vesicular membrane transport proteins. Small-molecule transmitters are usually contained in clear-core vesicles. Serotonin and norepinephrine are exceptions because they are contained in dense-core vesicles. 7. The appropriate stimulus results in the release of the neurotransmitter by exocytosis. These neurotransmitters usually mediate slow, ongoing brain functions. Only a few important peptides (e.g., substance P and enkephalins) will be discussed in this topic. The following steps are involved in the synthesis, transport, and release of neuropeptide neurotrans-mitters (Fig. 8-4B). 1. Polypeptides much larger than the final peptide transmitter (called pre-propeptides) are synthesized in rough endoplasmic reticulum where they are converted into a propeptide (pre-propeptide from which the signal sequence of amino acids is removed). The enzymes needed for the cleavage of polypeptides are also synthesized in the rough endoplasmic reticulum. 2. The propeptide and the enzymes are transported to the Golgi apparatus where they are packaged into vesicles. 3. The propeptide and enzyme-filled vesicles are carried along the axon to the nerve terminal by fast axonal transport (400 mm/day) via microtubules. Adenosine triphosphate-requiring "motor" proteins, such as kines-ins, are needed for this transport. FIGURE 8-4 Steps involved in the synthesis, transport, and release of neurotransmitters. (A) Small molecule neurotransmitters. (B) Neuropeptides. Ca2+ = calcium. 4. Enzymes cleave the propeptide to produce a smaller peptide transmitter that remains in the large dense-core vesicles. 5. The peptide neurotransmitter is then released into the synaptic cleft by exocytosis. 6. After the release, the peptide transmitter diffuses away and is degraded by proteolytic enzymes; it is not taken back into the nerve terminal as is the case with small molecule neurotransmitters. More than one transmitter (usually a small-molecule transmitter and a neuroactive peptide) coexist in many mature neurons (e.g., most spinal motor neurons contain acetylcholine and calcitonin gene-related peptide).